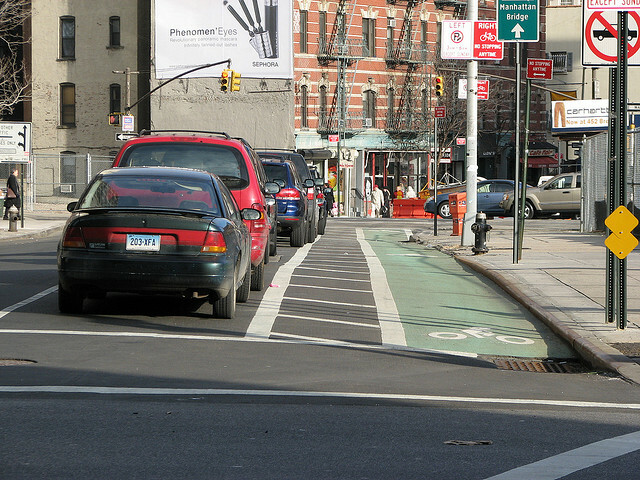 Physcially separated bike lanes, like the ones seen here in New York City, are gaining ground in Toronto. Photo by Kyle Gradinger. Forum Research, Canada’s largest survey firm, conducted an automated telephone survey that found strong support for Mayor Rob Ford’s physically separated bike lanes on downtown streets. Out of 1,050 survey participants, 72 percent said that they want the bike lanes, the Toronto Star reports. A second question in the survey asked if the participants would support road tolls to pay for the mayor’s planned but yet-to-be-funded Sheppard subway line. 65 percent of respondents replied that they would not support tolls to fund the subway line. When the same question was rephrased to imply the tolls would reduce traffic congestion, only 43 percent said they would support the tolls. The article reports that “the idea of charging drivers on main thoroughfares remains a non-starter with the public,” according to Lorne Bozinoff, president of Research Forum. But with zero funding and little public support for tolls, the $4 billion Sheppard line is yet to get off the ground. The city is relying on congestion charges, revenue tools and private investments to get the subway line built.